Schools to overhaul special education programming. (Click on "Download .JPG" to see large graph.) “A risk ratio greater than 2.0 for a racial/ethnic group indicates over-representation, while a risk ratio less than 1.0 indicates under-representation." Alexandria’s school system has proposed a three-year plan to tighten up top-down control of special education programming, and invites public feedback over the next two weeks. Though it centers on special education, the plan aims to improve the manner in which schools provide tailored instruction and support to all students generally. The plan stems from an audit, conducted by Public Consulting Group, a firm, over the 2017-18 academic year, and briefed to the School Board last month. Regarding programming for students with disabilities and their families, the consultants’ report says the school division “has a solid foundation on which to build.” But it cautions that the division’s current “site-based management model” cedes too much “autonomy” to individual schools. Tighter supervision from the top is necessarily in order to ensure greater “fidelity” — a word occurring 13 times in the audit’s 22-page executive summary — to best practices. Hutchings wants principals to maintain “some autonomy” because they “serve different populations.” However, there should be clearer “non-negotiable accountability measures,” according to the consultants’ audit. A new, permanent interdepartmental central office group to oversee implementation. “The message that I want to get out and people to hear is that 85 percent, plus, of the students with disabilities in this school district are average to above-average intelligence. That means that they can achieve commensurate or better with their non-disabled peers,” said Terry Werner, who heads up the division’s Office of Specialized Instruction. Inclusive practices are methods of incorporating students with disabilities into general education settings to the maximum degree possible, as required by the federal Individuals with Disabilities Education Act (IDEA). A principal method is “co-teaching,” whereby a certified special education teacher provides special instruction alongside a general education teacher in a general education classroom, rather than in a separate setting. Inconsistency shows not only in varying degrees of cultural buy-in, but also in other areas. 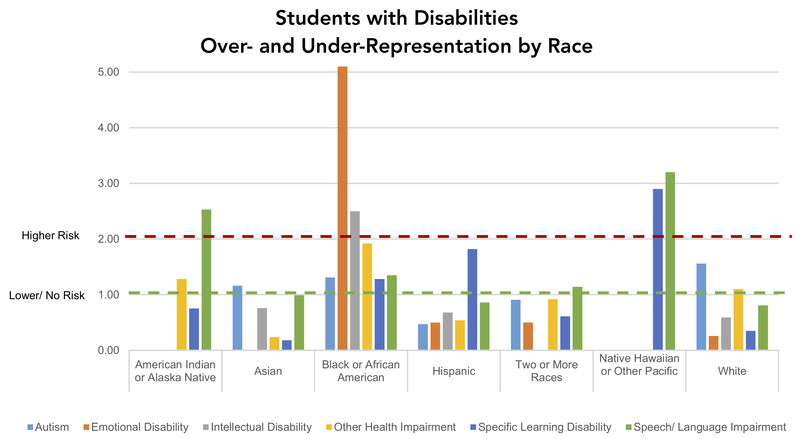 Of students with suspected disabilities who are referred for a special education evaluation, English learners are found eligible for special education half as often as non-English learners. The audit suggests this could be a good sign, perhaps indicating that the schools aren’t mistaking struggles arising from linguistic and cultural challenges as disabilities. But Janet Eissenstat, parent of a student with disabilities and chair of the school division’s Special Education Advisory Committee, is more dubious. She thinks more English learners may in fact have disabilities, but that language barriers may prevent parents from being able to advocate effectively for their child. Or testing may yield skewed results if not administered in the student’s native language. But the opportunity for improvement goes beyond special education. Eissenstat thinks the kinds of improvements indicated in the audit would help schools better “meet kids where they are” more generally — whether those students grapple with a disability, learning English as a second language, being a refugee, having suffered trauma, etc. This is especially true for racial “gap groups” persistently identified through standardized testing, she said. Under the division’s Multi-Tiered System of Supports, first established in 2015, educators are supposed to apply increasingly more personalized “interventions” for any student exhibiting academic or behavioral challenges. Interventions might involve extra instruction in small groups or one-on-one, or time with a counselor. In addition to honing the more reactive multi-tiered intervention approach, the audit recommends the division enhance training around the more proactive Universal Design for Learning. A school of thought first developed in the 1990s, Universal Design for Learning “aims to change the design of the environment rather than to change the learner,” according to CAST, an education research nonprofit. Training would seek to equip teachers in a more systematized way in a range of teaching methods and media that better align with students’ diverse learning styles and barriers. Find the audit report, the proposed action plan and information about upcoming public forums at www.acps.k12.va.us/Page/2331. Through Tuesday, Nov. 20, the public may provide feedback online at www.acpsk12.org/news/?p=11008. The school administration expects to present the final action plan to the School Board on Thursday, Dec. 20.